A group of celebrities took on the Bournemouth zip line to raise money for a charity well-known to Brewers, Entertainment Workshops. 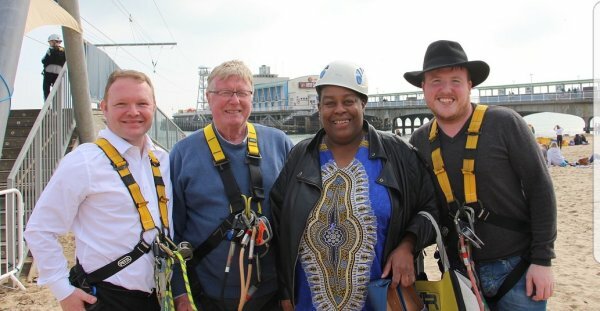 On Wednesday 11th April, celebrities including Sandra Martin from Gogglebox, Linda Lambert from Storage Hunters UK, Paul Bohill from Can’t Pay We’ll Take It Away and Simon Gross from Big Brother zipped from pier to shore to raise money for charity. Lord Brett McLean, Trustee at Entertainment Workshops, contacted Brewers after our recent support for their Celebrity Abduction event. Brewers have donated £250.00 to Entertainment Workshops for their Celebrity Zip Line event, which will help provide disadvantaged students with an alternative media-based education centre in East Sussex. A total of £350 was raised for Entertainment Workshops.